Editor’s Note: Now that this series is complete, here is an index of all 13 installments of Albert’s Antarctica Adventure! Helllllllloooooo, all you fine people! It's been a while, I know. We've gone a month without an update, and we're going to make the first Westcoaster update of 2018 something pretty darn unique too. Unsurprisingly, Antarctica gave the opportunity to see literally thousands of penguins. 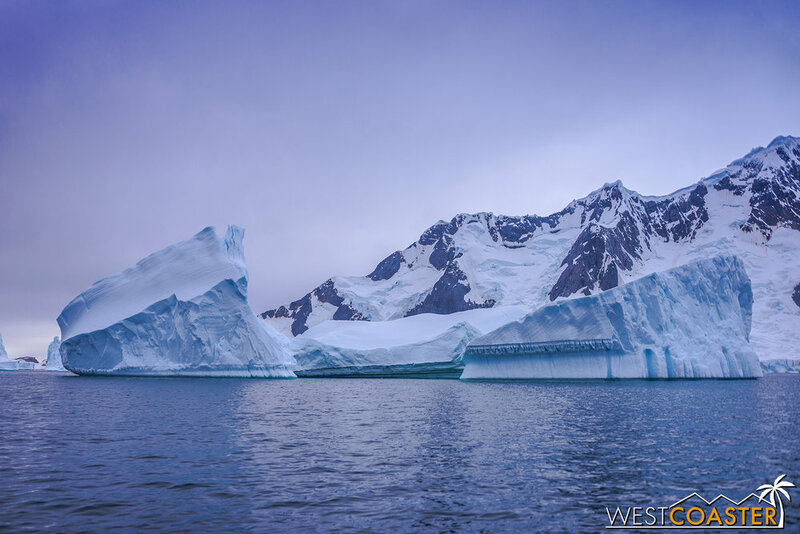 Naturally, I took a horde of photos, and there is so much that I'd like to share from the pristine wilderness of Antarctica that over the next few weeks (and probably months), Westcoaster will be featuring a series of trip reports covering my time in this great white south. These will fit under the "travel" portion of our site content, and I'm pretty sure not a lot of sites can boast content from Antarctica (our buddy, Ian, is an exception, though). Don't worry, it won't only be penguin photos for the foreseeable future (is that really a problem, though?). We'll still have our usual local parks updates and miscellaneous other content for diversity. But Antarctica... yeah, we'll also have that. A Zodiac boat gets close to a humpback whale in Neko Harbour, one of many sites we visited in Antarctica. Today, I'd like to cover just an introduction of the first couple of days of my trip, from embarkation in Ushuaia (the southern-most city in the world) through the first couple of days of our cruise. But before that, I'd like to detail a little bit about the logistics of such an exotic trip, since a lot of my friends have already been asking me about how this trip was put together and how I was able to make a once-unfathomable bucket list item into an actual reality. Although the world has grown more and more accessible and interconnected, Antarctica remains a rugged and unpredictable land, full of wild beauty and untapped majesty. Although modern transportation and technology have made visiting the 7th Continent a lot more viable than it was in the days of Shackleton and Amundsen, there is still a lot of uncertainty that should be allowed for any expedition to this remote and beautiful land. An iceberg gallery sets a moody ambiance in Pléneau Bay. The vast majority of all tourists seeking to visit Antarctica will need to book a trip with a registered member of the International Association of Antarctic Tour Operators (IAATO), a network of tour companies that charter trips to the continent and abide by a strict set of rules and regulations that have been established under the Antarctic Treaty System. This 100+ member alliance works together to ensure that tourist travel to this unspoiled continent has minimal environmental impact and is well coordinated among the various groups to keep landings isolated at each Antarctic site. The Antarctic landscape is resplendent and magnificent. 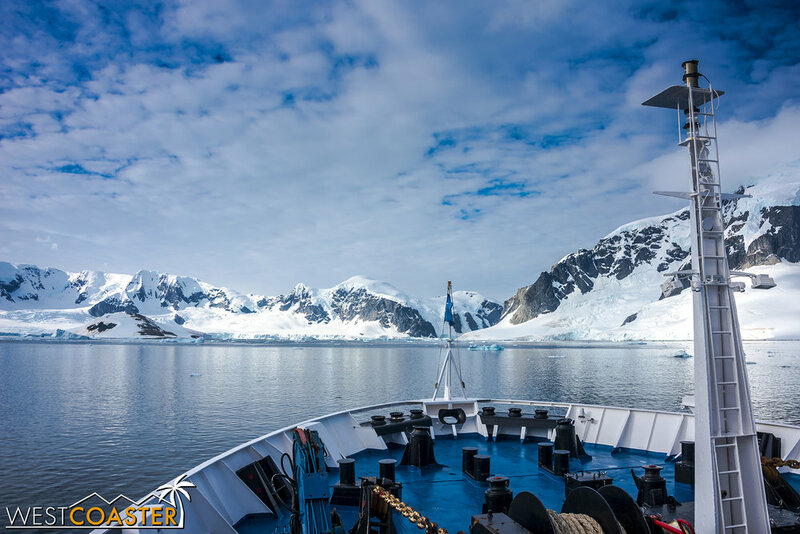 When it comes to mode of transportation, although there are limited flight options to Antarctica, most people should plan on reaching the continent by boat, with one of a number of cruise or small charter boat operations that are part of IAATO. I went on my trip with two friends, and we booked our cruise with Quark Expeditions, an American-owned company headquartered in Toronto, Canada, specializing in polar excursions. Quark came highly recommended from a friend of one of my travel companions, and I can say that we had an amazing and fantastic experience with them (they're not paying me to say that, though if Quark is reading and is interested in working out some sort of sponsorship for a future trip, I'm all ears!). There are plenty of other alternatives to Quark, of course. A principal at the company where I work had made the trek to Antarctica several years ago with Silversea, a pretty swanky polar cruise group, and we raced a boat associated with National Geographic departing out of Ushuaia at the same time we did. But through our brief research, we found that Quark was actually one of the less expensive options out there, without any sacrifice in quality or spirit of adventure. It's not a luxury cruise. It's more focused on just exploring Antarctica and visiting its many amazing sites. But while Quark doesn't provide an exquisite, high class experience, it still features very nice accommodations, fantastic food, and cheerful and intently generous service. The view from the bow of our Antarctic cruise ship, the Ocean Diamond. The most common way to reach Antarctica is to depart by ship from the bottom of South America, typically from either Punta Arenas, Chile, or Ushuaia, Argentina. Although many Antarctic tour operators feature bundles that bring guests in from more major cities such as Buenos Aires, I recommend booking something that only envelopes departure from the actual ports to sea, since a (for example) 11-day package that includes transit from, say, Buenos Aires will always mean one less day in Antarctica than an equivalently long 11-day advertised voyage directly from Punta Arenas or Ushuaia. It is not complicated to book your own flights to the southern edges of Chile or Argentina. Most likely, you will connect to Punta Arenas or Ushuaia via Santiago, Chile or Buenos Aires, Argentina, respectively. Booking your flights to the terminus cities will allow more flexible for any part of your vacation outside of the Antarctic cruise portion. In addition, I would allot at least two or three days time between departing one's home and boarding one's ship for the Antarctic cruise, in order to accommodate any potential flight delays that may occur on the way down south. On my trip, our original flight from Atlanta to Santiago ended up having an over 12 hour delay, and that spelled disaster for at least a couple of passengers I spoke to on the plane who were boarding their own Antarctic cruises the following day and would miss their connecting flight to the port cities. For these flight legs, often times, the next available flight is the next entire day! A slim margin of error really tempts the fates in this situation. And although booking the Antarctic Cruise will inevitably require the purchase of travel insurance to guard against loss of cruise due to weather conditions or even plane delays outside of passenger control--thereby mitigating financial loss if one were unable to board a ship to Antarctica--insurance won't guard against the frustration of missing a trip of a lifetime. We started our Antarctica adventure out of Ushuaia, a small resort city that has the distinction of being the city located the most southerly in latitude (there is at least one town in Chile that is more south by latitude, but it's very tiny and not any sort of transit hub for anything). This city has a history as a prison town in the late 1800s and first half of the 1900s--a past which still dots its colorful cityscape today. But more popularly in modern times, it is both a primary point of departure for cruises going to Antarctica and the gateway into Tierra del Fuego National Park--a part of Argentina's spectacular Patagonia region. Moody and untamed, Ushuaia and its surrounding regions are worth exploring just by themselves, and an extra day or two before or after one's Antarctica journey would be well worth the investment. 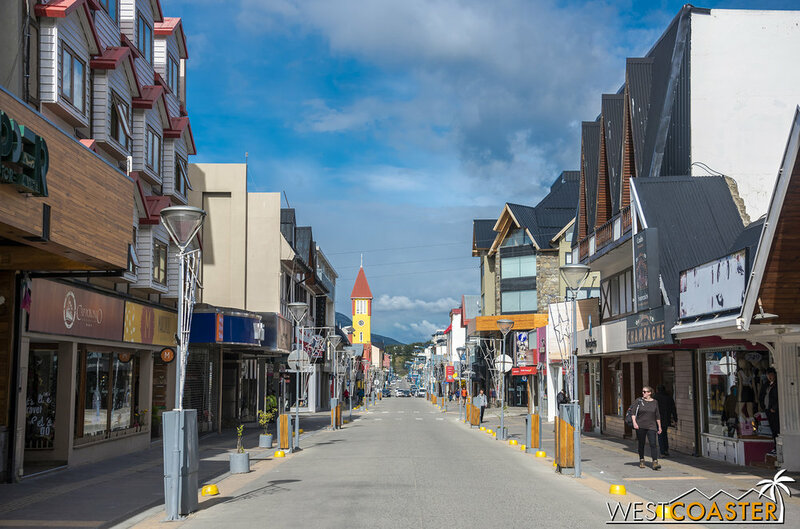 Ushuaia is served by a single airport--Malvinas Argentinas International Airport, the world's southernmost international airport and a pretty small and intimate base. For comparison's sake to Southern Californians, Ushuaia's airport is about the size of Long Beach Airport, located in Los Angeles County somewhat near the Orange County Border, if not a bit larger. But it's a fraction of, say, John Wayne Airport, and primarily serves air traffic coming from elsewhere in Argentina and also Chile. Special charter flights also fly into Ushuaia from a smattering of European countries, like the United Kingdom and Germany. Inside the main lobby of Ushuaia's very intimate international airport. The airport is located on a small peninsula island that appears to have been dredged from the water. A taxi into town will run about 200 Argentinian pesos (a little over $10 USD at the time of this writing) and take about 15 minutes. Bring cash for the taxi if you can. Most do not accept credit cards. Early morning down Ushuaia's main drag, Avenida San Martín. La Ultima Bita has a really cute outdoor gallery in a garden space behind the store. 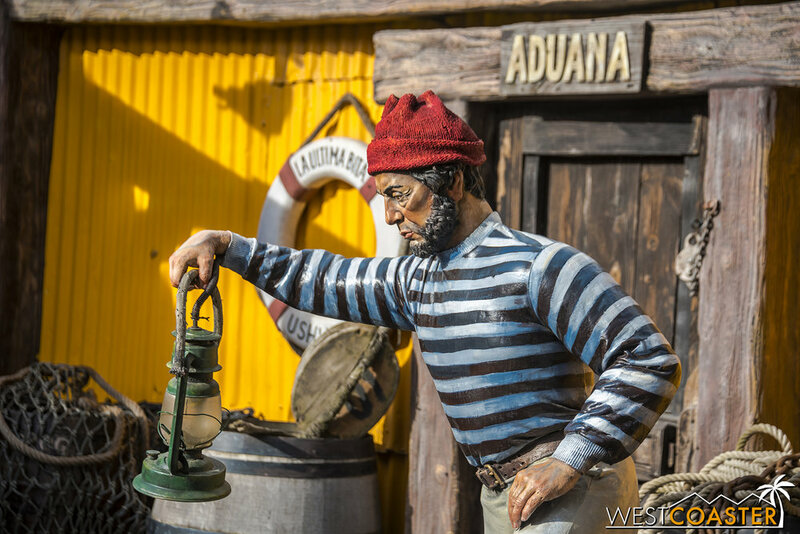 The End of the World Museum provides a glimpse into Ushuaia's past. And of course, those seeking a bit of nature might hike up the Martial Glacier trail or venture into Tierra del Fuego National Park--either by driving directly in or taking the tourist-friendly End of the World Train (Tren del Fin del Mundo). Note that visitors will need to pay a fee to enter Tierra del Fuego National Park regardless of entering by car or by train. Those coming by car can easily take a taxi from the city. A beautiful national park that features the southern-most post office in South America and a trail that brings guests to the actual Chilean border, Tierra del Fuego will more than satisfy those seeking Mother Nature in her rugged beauty. The (remnants of the) Martial Glacier dominate(s) the view in Ushuaia. The view driving into Tierra del Fuego National Park. The "End of the World" post office. The Costera trail offers some amazing views in Tierra del Fuego National Park and is one of several trails visitors can explore. We were able to do some of the aforementioned activities during our two days (one full day and two half days) in Ushuaia before we actually boarded our Antarctic cruise. It was actually beneficial to budget an early arrival, because (as mentioned earlier) this allowed a buffer to ride out any flight delays or issues that might otherwise result in missing the cruise if we had booked an arrival itinerary that brought us to Ushuaia on the day of or the day before departure. And delays we did get--our flight from Atlanta to Buenos Aires (originally by way of Santiago) was ultimately delayed 1.5 days. Had we started off our trip by flying directly to Ushuaia and then immediately getting on the boat, we very well could have missed our cruise entirely. Our Antarctic cruise with Quark Expeditions took us on board the Ocean Diamond, a large but still-intimate vessel that accommodated less than 200 passengers, plus the ship staff and crew and the Quark Expedition group. We intentionally booked a relatively small cruise because Antarctic Treaty agreements limit the number of people who can be on land at any Antarctic site to 100 visitors at any given time. The 187 passengers that wound up on our trip mean that we only needed two groups of landings at each site, instead of more. Logistically, that resulted in more efficient trips and visits. The view from the top of the promenade on board the Ocean Diamond. Walking along the side of the ship. The ship itself was sizeable yet cozy. 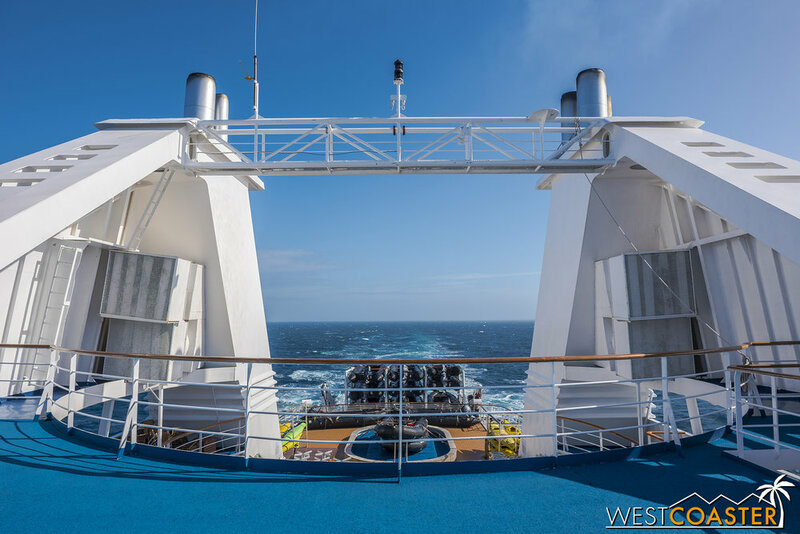 It had 7 decks--the bottom two reserved for crew and staff--with a large dining room and kitchen, satellite dining room, lounge area, main hall meeting and lecture hall space, a library, gym, observation deck, and a three-tiered outdoor promenade. One nice feature I found was that every guest cabin had at least one window to the outside. There were no claustrophobic interior cabins. And though the ship itself was a few decades old, its furnishings and fittings showed that in its early days, it was quite the luxury vessel. The storage and cabin layouts were clean, elegant, and well designed, with plenty of space to stow away our clothes and equipment and a furniture arrangement that optimized space and made the single-bay triple rooms feel spacious. Looking out the observation deck at the front of the ship. The main dining hall, located at deck 3. The ship, anchored in one of the many Antarctic bays we visited. We boarded the Ocean Diamond on the afternoon of Monday, January 8. This would be the first of ten days on board the ship--eight full days plus disembarkation back in Ushuaia on the last day. However, it would first take two days of sailing across the infamous Drake Passage before we would reach Antarctica. This afforded us time to learn about the history, geology, and wildlife of the continent via seminars held on the ship several times throughout the day. But it also meant that we were at the mercy of the notoriously unpredictable Drake for aforementioned two days. Departing Ushuaia aboard the Ocean Diamond. 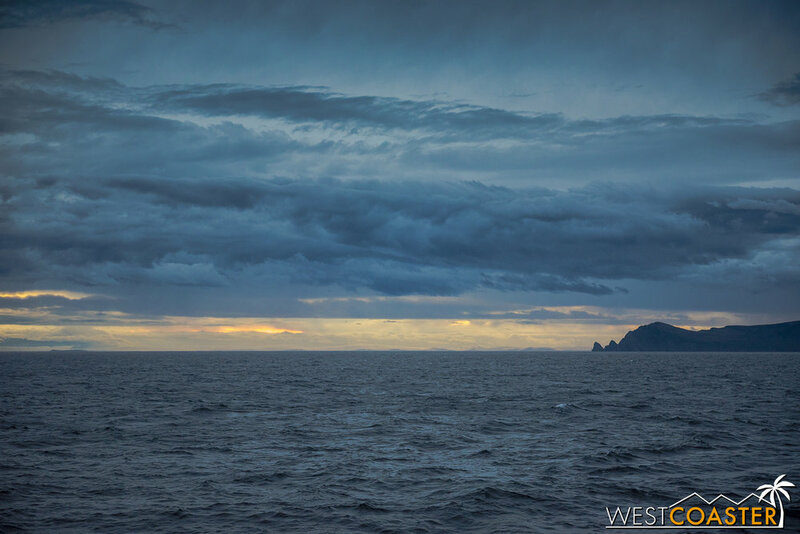 The Drake Passage can be one of the roughest bodies of water in the entire world, but it can also be calm and placid. With this stretch of water located between the South America tip of Cape Horn and the Antarctic peninsula, ships in transit often do not know if they will experience the "Drake Shake" or the "Drake Lake." And although certain parts of the year tend to be more placid than others, nothing is a guarantee in these seas. Fortunately, our passage through was closer to the "Drake Lake" than the opposite. Although we certainly felt the pitch and roll of the Ocean Diamond as it cut through the waters, and people needed a little bit of time to get their sea legs beneath them, the waters were generally pretty calm. When I asked the crew to rank this passage on a scale of 1-10 ("1" being still as glass, "10" being terribly stormy), they gave it a "3." So certainly not bad, which is apparently common for this time of the year. Leaving the Beagle Channel for the open waters of the Drake Passage. The tip of land is Chile and was the last bit of earth we'd see until we arrived in Antarctica. In an abundance of caution, I took Bonine once a day and wore my Sea-Bands throughout the trip. Even with these, I felt uncomfortable during my trip across the Drake, but fortunately, I never felt properly sick. Nevertheless, when I did feel like I might be close to nausea, I took some Queasy Drops or Tummy Drops to alleviate the symptoms, and they seemed to effectively provide some amount of relief. I opted for Bonine over Dramamine to avoid the drowsiness that Dramamine often presents (the anti-drowsy version is just a half dose of the same medicine), and I found that this generally worked pretty well. In fact, on my way back across the Drake to Ushuaia, I felt less discomfort despite the ocean conditions actually being slightly more intense than these first two days. In addition, one of my friends obtained a prescription for the Scopolamine Patch, which is placed on the side of the head behind the ear and worn for up to three days to provide continuous anti-motion sickness relief. Unfortunately for her, the side effects of major drowsiness and loss of visual focus were a major annoyance and persuaded her to remove the match after only two days' use. She was not a fan of how her vision blurred and how her body felt constantly sleepy and lethargic. Sea-Bands and the occasional Bonine dose seemed to work pretty well for her, though. When it is not disrupting people's stomachs, the Drake Passage is a great place for birdwatching. Petrels, Giant Petrels, Wandering Albatross, Royal Albatross, and even swimming penguins are common sights, and we did see quite a few during the two days in transit. Dolphins and whales are also popular across the Drake, though I think only dolphins were sighted during our trip to Antarctica (and not by me). A Wandering Albatross spreads its wings over the ocean waters. A Petrel takes flight next to our boat. The late evening of our first full cruise day also brought about an unexpected surprise--our first major iceberg sighting. And what a berg it was! Earlier in the day, the ship had announced a contest to guess what day and time we would spot our first bus-sized (or larger) iceberg. Looking at the maps, I guessed that this wouldn't happen for at least another 24-36 hours. But less than 12 hours after the contest was announced, the first iceberg appeared--a massive specimen the size of several large buildings put together. In the murky, gray blue dusk, it was an eerie yet spectacular preview of the ice-scapes we would soon be witnessing. Late on our first full day at sea, we spotted a large iceberg drifting by. As we passed it, we realized it was much bigger than any of us had even imagined! The afternoon of our second full day at sea brought a second surprise--word that we would be making our first Antarctic excursion. We hadn't reached the peninsula and continent yet, but our destination--Deception Island--was part of the South Shetland Islands and technically part of Antarctica. That would spark a flurry of activity and excitement throughout the ship as passengers got dressed in waterproof wear and readied themselves for our first landing and cruise. But to find out what Deception Island was like, you'll have to wait for the next part of this trip report.